The CR90 corvette, commonly referred to as the Corellian corvette, was a small, multi-purpose capital ship manufactured by Corellian Engineering Corporation. The Rebel Alliance CR90 corvette acted as a frontline combat ship for the early years of the Galactic Civil War. The ease of acquiring CR90 parts and mechanics made them a good fit for the desperate Rebellion. 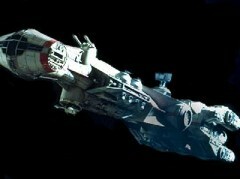 Its near ubiquity made it a popular choice amongst Rebels, pirates, and smugglers, earning it the nickname "blockade runner" for its ability to slip through Imperial nets.